Lausanne is known for its international schools, not least of all Brillantmont, but what other educational opportunities are there in and around this picturesque city? For students soon to enter higher education, there’s a wealth of options for schooling in Switzerland, with many available here in Lausanne. From leading technical universities to the world-famous hospitality schools that have produced many leading industry figures – will you be the next one? The University of Lausanne has more than 12,000 students and 2,300 researchers that both work and study together. The university says it encourages close cooperation between students, professors and teaching staff, which has helped it to attract more undergraduates each year. Courses on offer include bachelors and masters degrees and doctorates in areas relating to theology, law, the arts, social and political science, business and economics, geosciences, biology and medicine. ECAL has an excellent reputation for producing some of the finest artistic talent in Switzerland and indeed Europe. Students have access to excellent facilities and instruction, for the study of bachelors and masters degrees, plus other HE qualifications, in subjects such as Fine Arts, graphic design, photography, media, interaction design, film studies and industrial design. 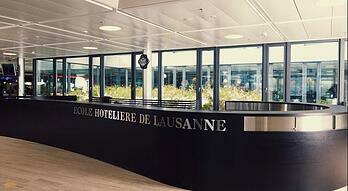 Lausanne’s hospitality schools are famous the world over for producing some of the hotel industry’s leading lights. Founded in 1893, EHL is one of the oldest hospitality schools in the world, if not the oldest, and as such is steeped in tradition and prestige. It even has its own “secret society” known as Le Cercle 1893, comprising of the most exemplary students. EHL has strong ties to other similar schools around the globe, and a diploma, bachelors or masters degree can open the door to graduate positions within the world’s leading hotel companies.